In India, Milad-un-Nabi refers to the celebration of the birth of the Prophet Mohammed. The word milad is the Urdu variation of the Arabic word, mawlid, meaning birth. The Prophet’s birth took place on the twelfth day of the Islamic month of Rab ̄ı’al-Awwal in the Sunni tradition, or the seventeenth day in the Sh ̄ı’ite tradition. Muslims all over the world honor the date, but differently, according to local custom (and, I argue, local politics). While I was conducting fieldwork among religious women in a poor, largely Muslim, enclave in Hyderabad, I observed the city’s large-scale public festivals and the women’s thoughts about these celebrations. That year, 2010, marked the height of public revelry celebrating Milad-un-Nabi. This was no coincidence, as the festivals (and the riots that ensued) occurred just after the passage of a controversial reservations bill that would allot 4% of government jobs and university seats to Muslims. 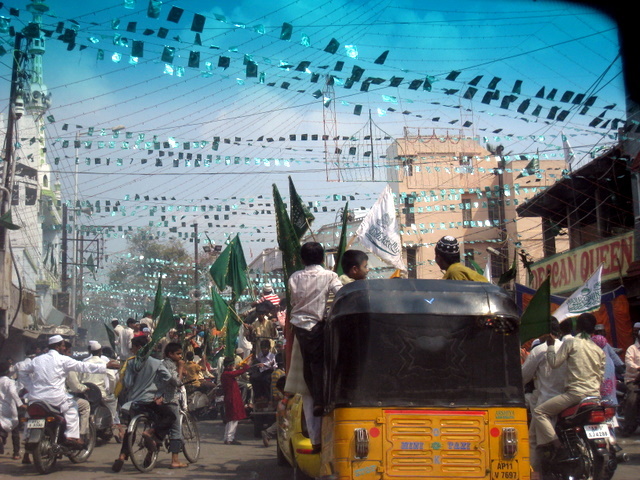 Milad-un-Nabi thus became a public site for marking and demonstrating local political power, especially in the presence of opposition to policies like the reservations bill.